My Cebu Guide is on the ground in Cebu bringing you all the best hotels and resorts on the island. We specialize in making your dream vacation a reality. No Hidden Fees or Charges. Remember that many of our competitors add up to 20% at the end of the booking process. At My Cebu Guide the price you see is the price you pay. My Cebu Guide is a content-rich hotel booking site. We offer you more than just a smooth booking process. We also bring you everything you want to know about Cebu. If you would like to get right to the hotel selection process then click the Cebu Hotel Locations link in the Hotels side menu. This will allow you to see the differences between each area of Cebu and the hotel options you have in those areas. Click a location and start looking for that perfect accommodation. Once you find what you are looking for the booking process is as easy as 1-2-3. If you know which hotel you are looking for then please use the Hotel Quick Finder on the top menu. If you are interested in the other aspects of what makes Cebu such an amazing holiday destination then please look at the General Information links on the left side menu. Want to know more? Check out the activities, restaurants, and entertainment sections also located on the left side menu. Have questions or special requests? Please feel free to contact us through any of our easy communication methods listed here. Our highly trained Cebu experts know everything there is to know about Cebu. No request is too big or too small. Contact us and let us help you make your holiday extra special. Cebu City is situated off the eastern coast of the main island of Cebu Province in the southern Philippines. Cebu City is the capital of Cebu and the second largest and most significant metropolitan center in the Philippines. The city is located on the eastern shore of Cebu and was the first Spanish settlement in the Philippines, making it a center of art and culture. It is affectionately known as the "Queen City of the South." There is a wide range of Cebu Hotels and Resorts that cater to tourist and business travelers, and is usually the jumping off point to other Cebu Island hotel destinations. For foreign tourists, it is often considered the best mix of modern city convenience with tropical island lifestyle. Mactan Island lies a few kilometers southeast of Cebu mainland. The island is connected to Cebu Island by two bridges, the Mandaue-Mactan Bridge and the Marcelo B. Fernan Bridge. Mactan is developed and urban, but there are some nice beaches on the coast, and some very upscale Cebu Hotels have been developed there. There are some fantastic dive sites near the Mactan coast, and the island is famous for local handicrafts such as the guitar, and other wood crafts. The Philippines second largest international airport is located on the island. Malapascua Island is both a peaceful, remote tropical island with an awesome beach, and a diver's paradise destination. There are some fantastic dive sites near the island, the most famous being the Thresher Shark dive. The island is 3 kilometers long and 1 kilometer wide, with a population of about 4,000. The main beach (Bounty Beach) has white sand beaches and crystal clear waters. The west coast is ideal for swimming and snorkeling. A walk or tour of the whole island can be done within half a day. Malapascua Hotels and Resorts are mostly budget hotels, but the higher end hotels are of good value. 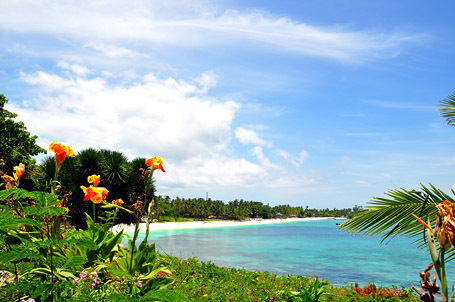 Bantayan Island is located at the northernmost tip of Cebu mainland and is composed of three municipalities, namely Sta. Fe, Bantayan and Madridejos. Aside from having one of the oldest churches in the Visayas and Mindanao, it is also known for its massive white sand beaches and crystal clear waters. Bantayan Hotels and Resorts dottingthe island's shores offer a mix of local and international cuisines as well as vast arrays of fresh seafood to choose from. It would take you several days to completely explore the Bantayan Island. Moalboal is on the Cebu Island mainland; an easy 90 kilometers from Cebu City. It is famed for some of the best diving in the Philippines,and its white sandy beaches. There are two main tourist beaches, and most Moalboal Hotels and Resorts are located on either Panagsama Beach or White Beach. White Beach is has a slightly nicer beach, and Panagsama Beach has more of the restaurants and nightlife. The nightlife is generally calm and relaxed. During the day, there are waterfalls and caves and other beautiful sights to be explored. Moalboal Hotels and Resorts are mostly suited to diver and value travelers, although there is something for every taste and budget. Other Cebu Areas - Cebu Island Hotels and Resorts dot the coast of the 225 kilometer Cebu Island. There are numerous beautiful beaches, deep cave systems, sleepy fishing villages, tropical jungles, waterfalls, and secluded budget to high end hotels and resorts. There are some nice "all inclusive" resorts and spas, and also some budget rest houses for adventurous explorers. Cebu Island has a perfect blend of Spanish-era history and stunning natural beauty. We hope that this information helps you to select the perfect Cebu hotel. Please enjoy the wealth of Cebu information that our site provides. If you have any specific questions feel free to contact one of our Cebu experts.